A $300,000 public sculpture dubbed the 'Gateway to the Great Barrier Reef' is set to be unveiled on the Cairns Esplanade later in the year. Designed to increase awareness of reef conservation, the sculpture aims to become the cornerstone of the Citizens of the Great Barrier Reef campaign. Created by local indigenous artist Brian Robinson, the sculpture is set to be completed by the end of August and is on track to begin being manufactured in Brisbane. 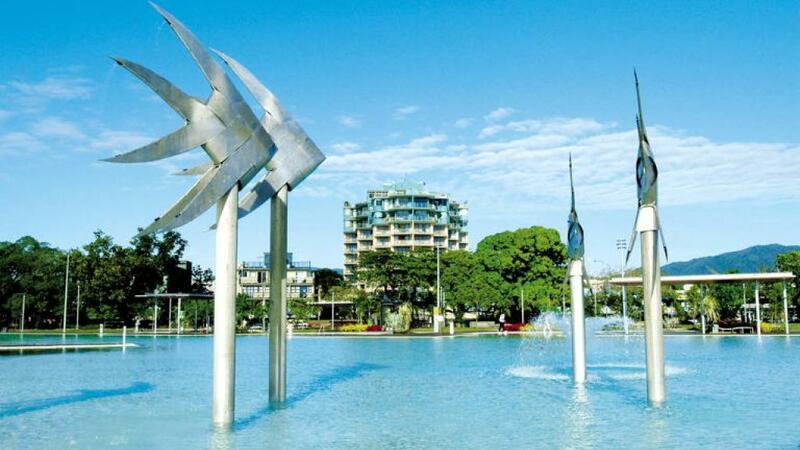 Born on Thursday Island, Robinson is of the Kala Lagaw Ya and Wuthathi language groups of the Torres Strait and is best known for his iconic Woven Fish sculpture that is already featured at the Cairns Esplanade lagoon. The steel sculpture measures 6m high and 11m long and will represent the many important Great Barrier Reef attractions. The artwork will feature a stylised stingray with its iconic tail forming a helix to point back to a wave. Caught in the wave will be other reef marine life including fish, crabs, crocodiles, turtles, dugongs and sharks. Robinson believes the new sculpture will be just as iconic as his previous artwork Woven Fish. "It will be in place only a stone's throw away from the actual swimming lagoon, situated on the grassy area to the left of the lagoon, down in one of the corners there," he said. The sculpture will be part of a $5 million campaign that aims to ensure the protection and longevity of the Great Barrier Reef. The 'citizenship' program and related marketing campaign will bring together all parties connected to the reef including education, science, tourism and conservation. The government-funded social purpose movement is a world-first that encourages and empowers individuals from around the globe to collectively make a change and ensure the future of the reef. By applying for membership to become a 'citizen' of the reef, 'Citizens' will be able to vote on how real funds should be spent in order to rejuvenate and protect the reef and then be informed on all the progress and outcomes of the money spent.